PCH, Maximum Minivan Edition: Toyota 4x4 Or Turbo Caravan? Welcome to Project Car Hell, where you choose your eternity by selecting the project that's the coolest... and the most hellish! Last time we had another PCH Superpower upset, with Germany beating Britain in the Glas Versus Lotus challenge. Britain will come back strong, of course, but for now Germany can enjoy the pool of oil gathering beneath the Project Car Hell trophy. 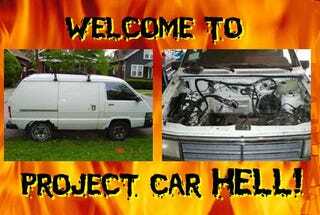 Fast forward to today; since it's Maximum Minivan Day, we're going to have Maximum Project Minivan Hell. For a Toyota to qualify for Project Car Hell, it must be rusty, rare, and packed with impossible-to-find options. We've found all three with this 1989 Toyota 4x4 van (go here if the ad disappears), which has some body rot (in a refreshing display of honesty, the seller sums it up in a single word: "Rusty") and the super-rare-in-North-America 4x4 drivetrain option. There's an assortment of minor (you hope) repairs to do, and it's nearly certain possible that the overheating problem will be tougher to remedy than the seller implies, but it's a Toyota! That means you can't just get it back to factory condition. No, you need to make it into a high-powered, mud-slinging, mountain-climbing beast, just the thing to help you flee the burning cities of the Financiapocalypse in style! For that, you'll be exploring the power-handling ability of the drivetrain's components by bolting on a supercharger (preferably with air intake inside the passenger compartment, for added ventilation), then adding some gun racks and maybe a still. Hey, you'll need to be able to produce "whiskey" from fermented possum innards, once you've reached your compound in the mountains/desert/bombed-out industrial park, because barter will be king in the post-Financiapocalypse world. Let's say society holds together just well enough to provide for a veneer of civilization, yet without the steady jobs and stuff of the pre-Financiapocalypse world- what then? You need to be ready to make money street racing! You see, the legions of the unemployed will need entertainment, and what's more entertaining than no-guardrails racin' action down Main Street, with paid-off cops refereeing and wheelbarrows of worthless fiat currency changing hands with each match? In order to roam from town to town, fleecing the locals like those guys in the '55 Chevy in Two Lane Blacktop, you'll need a serious sleeper to race… and you can't get much more soporific than a Chrysler minivan. We all know that you can get 12-second quarter-mile times just by going crazy with the boost in a turbocharged Voyager or Caravan, but they're a little hard to find these days. However, we're on the case, and we've found this 1989 Caravan Turbo for you (go here if the ad disappears). The price? A mere 400 bucks! It's an automatic, but you can get a 5-speed in one (preferably the nice Getrag out of a late Shelby Mopar)… but first you need to put it back together. You see, the seller alleges that it was running when he or she pulled the engine and transmission a while back. You might wonder why you'd want to remove the engine from a perfectly good runner, but sometimes you just get bored- next thing you know, the engine's on the driveway! Get it back together, add insane boost levels, and you'll be ready to take the money of those Camaro-drivin' suckas! Which minivan makes the best post-Financiapocalypse Hell Project?